Zander and his friends are in trouble--again. The freedom of expression they've enjoyed by publishing their own school newspaper has spread all the way to England, where kids from a school "across the pond" are now contributors to their own school's most talked-about publication. When photos start to go alongside the articles written by kids, things get suspicious. Zander, Kambui, LaShonda, Bobbi--and a bunch of students from Harlem's DaVinci Academy and London's Phoenix School--come to learn that words and pictures in a newspaper don't always tell the whole story. 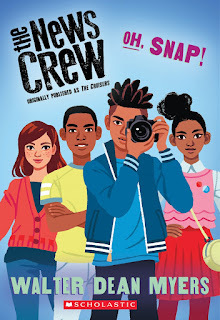 With his signature on-point pacing and super-smart characters, award-winning author Walter Dean Myers's acclaimed series delivers another awesome book about a group of middle-school misfits who are becoming the coolest kids in the city.